← The Retro 51 Harley-Davidson® Series Adds New Pens & An All-New Collection! 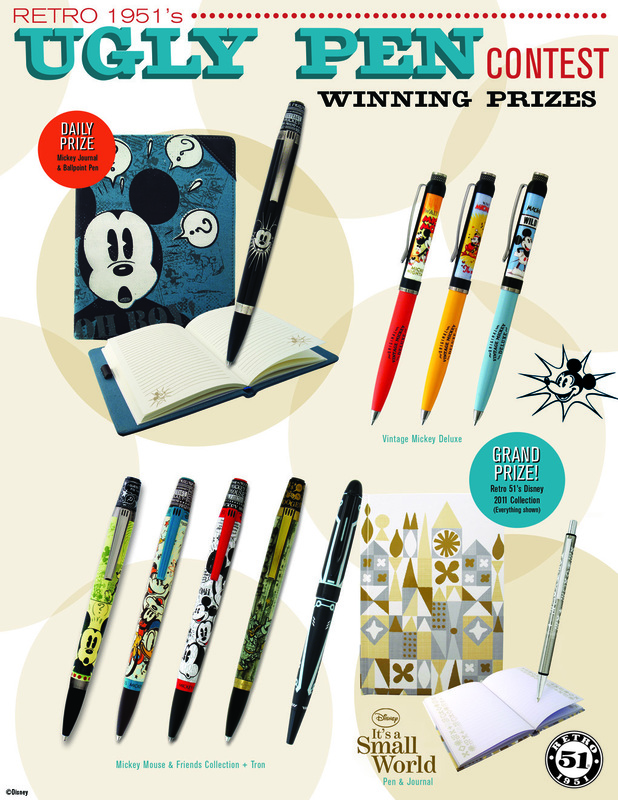 Enter Retro 1951’s Ugly Pen Contest at Disney’s D23 Expo! Attention all Retro 51 Fans! On August 20th-22nd, Retro 51 will be on hand at the D23 Expo in Anaheim, California. Heralded as the “Ultimate Disney Fan Event”, this year’s Expo will celebrate 25 years of Magic at D23, and kicks-off on Friday, August 19th. If you’ve never experienced the Expo, or visited with the Retro 51 team in person, this year would be a great time to do both! We’ll have our entire Disney Collection on hand, including our Cars Laser Red & Silver Bullet Ballpoints, the Mickey Mouse & Friends Series, and more. And did we mention we’re having a contest too? That’s right! As you know, at Retro 51 we believe that “life is too short to carry an ugly pen.” But chances are you own one or two ugly pens, right ? C’mon be honest. 🙂 If so, bring those pens out with you to the Expo, and enter the Retro 51 Ugly Pen Contest. You could win our our entire Disney 2011 Collection (valued at more than $500 retail)! We’ll also be giving away one Mickey Journal and Pen Set ($80 retail value) each day between August 20th-August 22nd to one lucky winner! Please see the first flier above for the official rules. And we look forward to seeing you (and your oh-so ugly pens) at D23! i don’t think they are ugly at all, you are being facetious. They are rather cute.